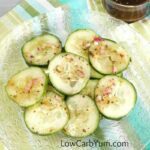 Enjoy these tasty low carb gluten free oven fried green beans alone or paired with your favorite grilled meat. 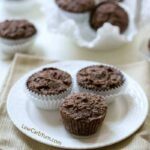 Baked with Parmesan cheese and almond flour. I have been wanting to try oven baked green bean fries for a while. I’ve seen several recipes online and they all seemed pretty quick and easy so I decided to finally give it a try. 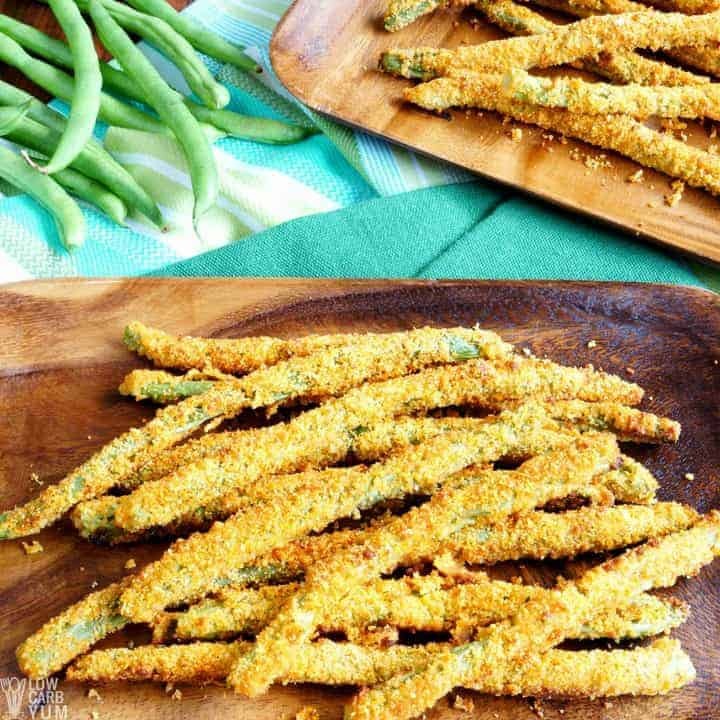 My two year old daughter eats regular cooked green beans like french fries so I thought she would really enjoy these oven fried green beans. I’d say green beans are probably my family’s favorite vegetable so we have them often. Last year, we planted a couple green bean plants in the garden and it was nice to cook them up right after picking. I’d like to grow more green beans in the garden this summer since we love them so much. This is a super simple way to cook up green beans. Most of the recipes I found used either olive oil, eggs or a combination to moisten the green beans. Then, the coating was added in the same bowl and tossed to coat. To start things out, I combine an egg with olive oil in a small bowl and set this aside. (photos 1-3) This mixture is what I use to dip the green bean in to get the “breading” to stick. 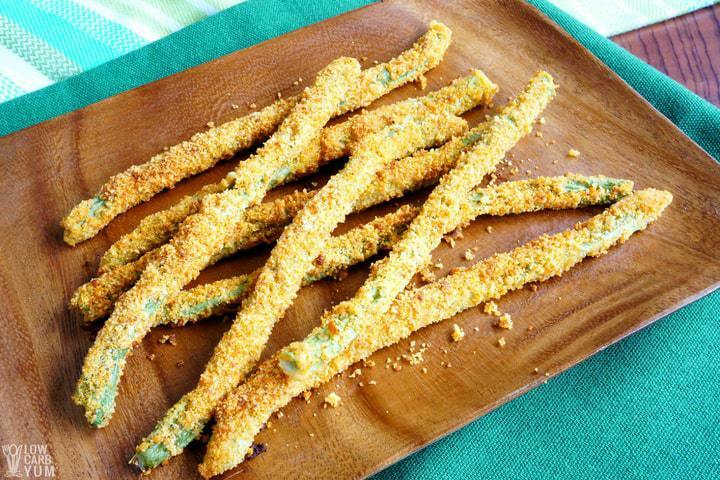 The recipes for fried green beans that I found used a mix of Parmesan cheese and spices. But I decided to throw some almond flour into the mix. Although I thought these green beans were pretty tasty, I may try to change up the coating mix next time with different spices and or cheese. You really can’t go wrong with cooking up green beans, unless you happen to totally overcook them. I picked up a pound of green beans at our local ALDI. They didn’t look like the freshest batch, but they hadn’t completely spoiled. I think they may have just been around for a while since picked and possibly handled a bit rough. Not a big deal to me. I was coating them anyway. However, I grabbed some fresher green beans to make the fries in these photos. You don’t have to line the pans with foil, but I like that it makes cleanup easier. You could probably skip drizzling the pans with oil if you want. However, I like to take in as much fat as I can because fat intake is really important when you live a low carb lifestyle. 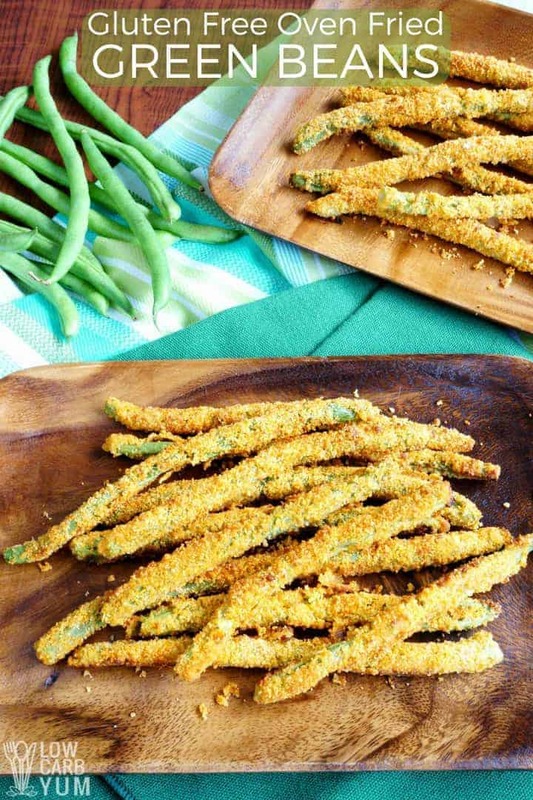 These tasty green bean fries are definitely something that I will make again. 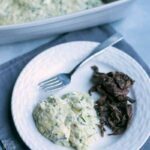 It’s such a simple recipe that works well for a busy weekday dinner after work. My daughter didn’t seem to like the added coating on the green beans. I think she is just used to eating the vegetable plain so it was the different texture that threw her off. That’s okay because I really liked them and was able to eat the rest of them over the next few days. 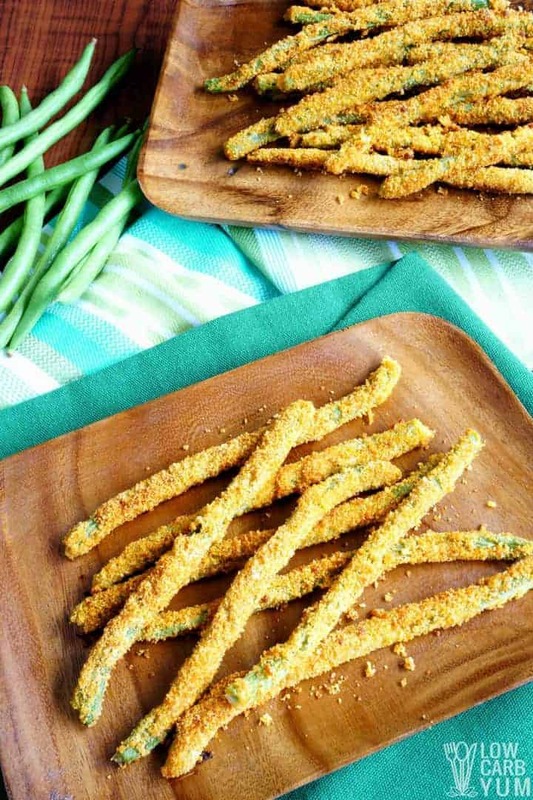 Enjoy these delicious coated oven baked green bean fries! And let us know what you think in the comments. 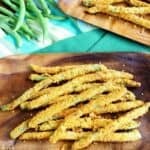 Enjoy these tasty low carb gluten free baked green bean fries alone or paired with your favorite grilled meat. Baked with Parmesan cheese and almond flour. Preheat oven to 425°F. Line two baking pans (about 15.5x10.5-inches each) with aluminum foil and drizzle with olive oil. Beat together egg and olive oil in large bowl. 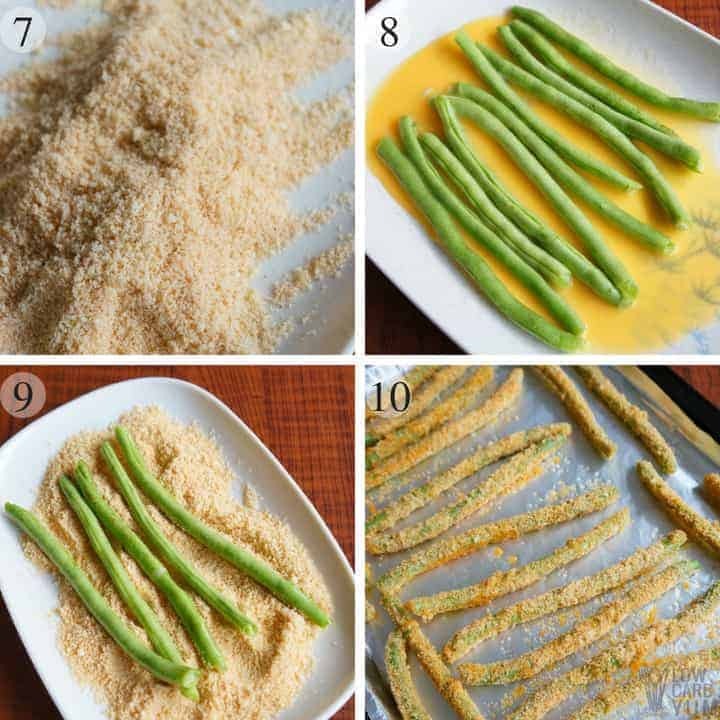 Coat green beans in mixture. Mix remaining ingredients in separate bowl.Toss beans in dry mix to coat well. 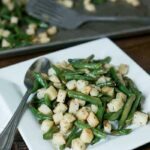 Pour green beans onto prepared pans and bake about 15 minutes or until crisp. If needed, place under broiler for a few minutes to crisp. Could you freeze these before you cook them? Wondering if I could make large batches and freeze on a cookie sheet, and then divvy up into a few freezer bags. Would these work in a fry daddy? They work in an air fryer, but may not work in a fry daddy since they are supposed to be baked. I made this exactly as stated. 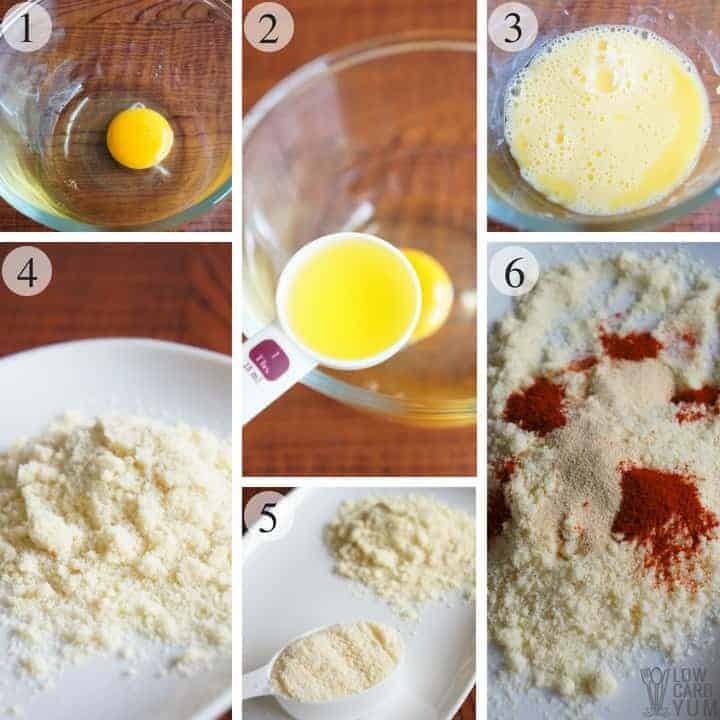 When I make them again, I will add more flour plus some panko or some seasoned bread crumbs. . I would like more crunch. Very tasty. I’m looking forward to trying these! I plan on bringing them to a pot luck this weekend. Is putting them in a crockpot on warm gonna be my best option? The warm setting should be okay as it’s very low temperature. Can these be easily adapted to cook on the grill? With warm weather so close I am hoping to eliminate cooking inside and out at the same time. They look delicious and I can’t wait to try them either way! The grill is pretty much a convection oven so I don’t see why not. You’ll just need to put them on or in something so they don’t fall through. Best way to reheat leftovers? Toaster oven, but you can microwave too. Loved these! I swapped out nutritional yeast for parm and added 1/2 tsp of onion powder. I baked 1 half on a pan without oil. They turned out well. And I baked the the other half on a pan that I’d just used to roast chicken. They also turned out well. Big hit! 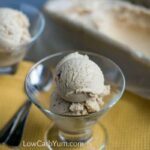 The nutritional yeast is a great dairy-free option! I’m on Whole30, which is dairy free, so I substituted 1/4 cup nutritional yeast and eliminated the Parmesan. These are my new favorite vegetable! Thanks! Thanks for the idea! I’m dairy-free now so I will certainly do that next time. I’m making them tonight with the nutritional yeast in place of the parm. I like parm, but I only buy the fresh shredded/grated, not the canned stuff, and I’m more fond of it on spaghetti sauce. Can’t wait to taste! Hope that works out. I sometimes just add almond flour in place of Parmesan since I try not to eat too much dairy. Definitely drizzle with oil. I ended up with a big stuck to the pan mess. Tasted okay but definitely not appealing. You could try using a non-stick liner next time like a silicone mat or parchment paper. Hello! These look fantastic. I cannot wait to make them. How many are in a serving size? It’s about 8-10 green beans per serving. I’d use them frozen and adjust cooking temp/time. I’ve never tried it, so it would take some experimenting. Did you end up trying them frozen? I couldn’t find fresh so all I have is frozen with the same question. To thaw or no to thaw. Let me know if they worked out. Making tomorrow for family dinner. I would thaw them and blot off as much of the liquid as possible. I’m def trying this recipe! 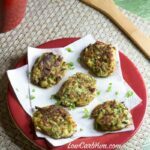 I also like them stir fried with bacon bits and onion with sprinkles of Parmesan on top! This recipe sounds fantastic. Easy is right up my alley. Thank you for sharing. I need to learn to eat more low carb and more gluten free, eating healthier. 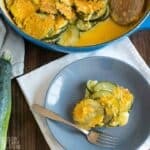 I’m not a big cook so this recipe and ones like it are great for me. Thank you again. I don’t think you have too many adds either. I want to make these tonight. Did u use fresh grated parmesan cheese, or the one in the green can? Great to have you here Michelle! These turned out great!! Used some shredded parm along with the grated. I will definitely make them again. I followed the instructions exactly and had to toss my beans in an egg paste, and they are too ugly to make my kids want to eat them. I guess I should have thought it through, but I have three kids who keep interrupting me and I didn’t have time to evaluate. Only after it was over did I scroll down and read the comments where you said you needed to clarify. Please change the instructions! Thanks for the reminder. I have added clarification to the recipe based on your comment and the other. Do you use real parmesan or the stuff in the green can? I used the stuff in the can for this one. I made these tonight and they were excellent! The only thing I did differently was add a bit more parm. So excited to try your other recipes now! Thanks so much for sharing this. You’re welcome Lisa. The more cheese the better! When I enter the recipe into My Fitness Pal they come up with different calorie per serving? Any idea why the discrepancy? Was really looking forward to this recipe, but they have it listed as 365 calories per serving? I believe I used Calorie Count to calculate for this recipe. It really depends on the ingredients chosen. Each ingredient can vary depending on brand selected and the accuracy of the data. Do you toss the beans in the egg/oil mixture first and then in the spices, cheese and flour? It’s not written that way, but seems like that would make sense?? That is what was done. I guess I need to clarify. I’m on atkins so I think ill melt butter and roll in parm. Sound delish. Love to try new recipes. Found your site. Every few seconds I had to deal with a pop-up. No way! Won’t be back. Sorry about the ads. I will be reducing them when traffic is better. It’s on the list to tone down, but needed right now to fix some of the blog issues. Ads aren’t tacky, they are a perfectly reasonable way to support an amazing food blog as needed. 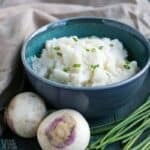 Yours is one of my favorites and I use and enjoy your recipes all the time! Keep being awesome and thanks for sharing that awesomeness with all of us. Do you have to use almond flour or can you skip it? 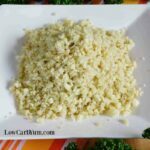 You could add more cheese in place of the almond flour. You’re very welcome Joe. Thanks so much for stopping by and giving some feedback on the recipe! These sound really good.. Im definitely going to try them.. I bet I’ll love the parm on them.. usually I dont care for things that are made with parm as a crust.. but I love green beans with parm. Yum! Thanks!